Exactly one month ago Steve Kerr and the Warriors faced a 2-1 deficit in the conference semifinals against the Memphis Grizzlies. 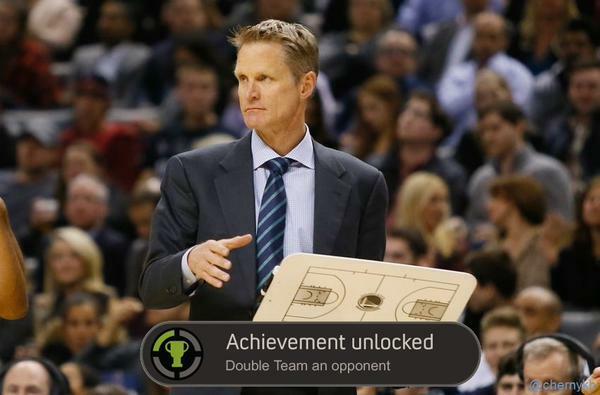 It was the first time Golden State’s golden coach was faced with a dash of adversity. After sweeping the Pelicans in the first round, the Warriors lost back-to-back games to the Grizz including a rare loss in Oakland. Kerr and his staff had to figure out how to make sure Marc Gasol and Zach Randolph wouldn’t continue to kill the Dubs’ interior defense by racking up points at the rim. In a radical decision, they decided to stick Andrew Bogut on Tony Allen and dared a 27% career three point shooter to take wide open jumpers from the corner. Allen obliged and built himself a pool house made of brick. The decision also cut off Allen’s space to cut on the baseline and deliver a drop off pass to one of the two bigs. Most importantly, it gave the Warriors and extra body inside to stop the Grizzlies from pouring in points from five feet and in. The move forced the Grizzlies to beat the Warriors with outside shooting, aka Memphis’ kryptonite. The complexion of the series shifted and the Dubs immediately snapped out of their brief funk. 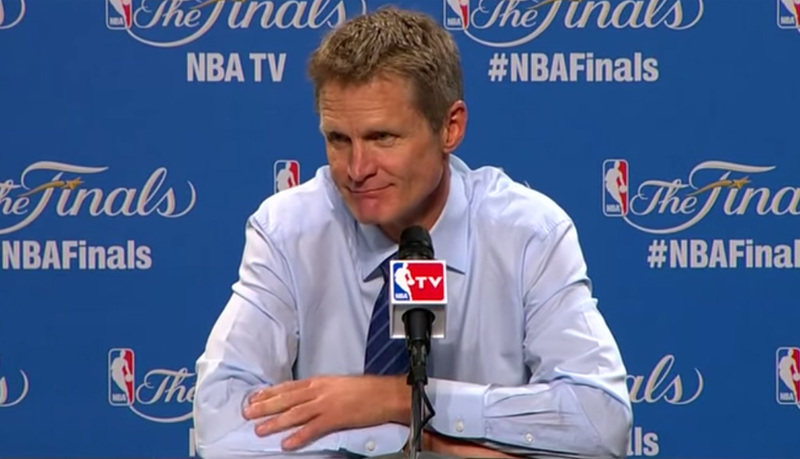 One month to the day of this drastic switch, Kerr was faced with similar circumstances. His team had fallen at home for just the fourth time this season and then lost on the road in Game 3 by a deceptive five points (Cleveland led the game wire-to-wire and it felt like they won by 15). It was clear an adjustment needed to be made. LeBron was taking a step towards immortality with every 40-12-8 line. Timofey Mozgov was etching his name as one of the greatest centers to ever play the game. Matthew Dellavedova went from being a backup point guard to having the arena in his hometown named after him (the Dellavedova Dome. This is not a joke. #Dellavedome) and James Jones was actually making appropriate decisions on a basketball court. Then with one swift move, Kerr’s staff once again changed the complexity of a series with an adjustment. Just before the tip of Game 4, Andre Iguodala was announced as a starter in the place of Andrew Bogut. It was a direct contradiction of what Kerr had stated earlier in the day about replacing Bogut in the starting lineup. The timing couldn’t have been better. Even though the Cavs jumped out to a 7-0 run and ignited a crowd that rivaled Roaracle at its loudest, the Warriors were able to settle down and control the pace. You could feel a shift start to happen in the first quarter when Draymond Green recognized that the Cavs were slow getting back on defense after a LeBron layup and flicked a perfect pass to a streaking Iguodala at midcourt who transformed into Flight 9 and flushed home a dunk. It was the first time in the series where the Warriors caught the Cavs sleeping and it felt like a significant moment. The Warriors then proceeded to bend the Cavs defense with wide open corner threes and ball movement that actually resembled Golden State basketball. Cleveland has dared Harrison Barnes to make corner threes this entire series and he actually came to life in Game 4 including drilling a big one after the Cavs had cut the Dubs lead to 73-70. David Lee had a nice showing in 15 minutes off of the bench and actually forced Tristan Thompson to miss a shot because of something called defense. Green finally resembled the player who has earned max money this offseason. Perhaps all he needed was his mother and grandmother to tell him that he needed to stop bitching at the officials and worry about playing basketball. The Splash Brothers were decent as a group in Game 4. Iman Shumpert’s suffocating defense didn’t allow Klay Thompson to establish any sort of rhythm and while Curry’s final line (22 pts, 6 asts, 8-17 FG, 4-7 3PM, +18) is nice, he still didn’t have the sequence where he uses his MVP powers and swings the game with threes on consecutive possessions. 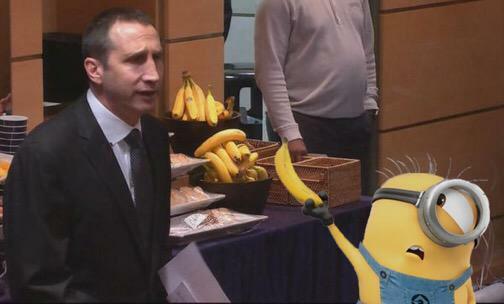 You have to wonder at this point if that moment is going to actually happen during this series. On the defensive side of the ball the Warriors were a bit more aggressive in how they handled LeBron. This was on display during a possession midway through the second quarter, LeBron was posting up Iguodala near the right elbow and Curry ever so slightly inched over towards LeBron, leaving Dellavedova wide open from beyond the arc. LeBron made the pass to Delly and it resulted in a thud off of the rim, which was a frequent sound for the Cavs from deep in Game 4 (4-27). J.R. Smith was 2-12 from the field and 0-8 from three, but he also provided us with Internet gold, so I think we should just give him a pass. Wait… he’s going to shoot it if we give it to him. QUICK, SOMEONE STOP HIM. The story of Game 4 wasn’t J.R’s Segway, LeBron’s head after he flopped his way into a camera underneath the basket, Andrew Bogut’s desire to use up half of his fouls in three minutes while trying to rip Mozgov’s name off of the back of his jersey, the severe disadvantage the Warriors have on the glass when they go small and the Cavs have Mozgov and Thompson on the floor, or the amount of bananas the Cavs had in their locker room during halftime. The story of Game 4 was the suggestion by video coordinator Nick U’Ren and the decision by Kerr and his staff to start the game with Iguodala in the place of Bogut. The subsequent response by Flight 9 is why he should be considered the Warriors frontrunner to win The Finals MVP at this point. Try wrapping your head around that last sentence. Someone who didn’t start an entire game this season before Game 4 of THE NBA FINALS has been the best player for Golden State. It’s just the way Steve Kerr and his staff drew it up. Previous Previous post: Is LeBron James becoming The Villain in his homecoming tale?